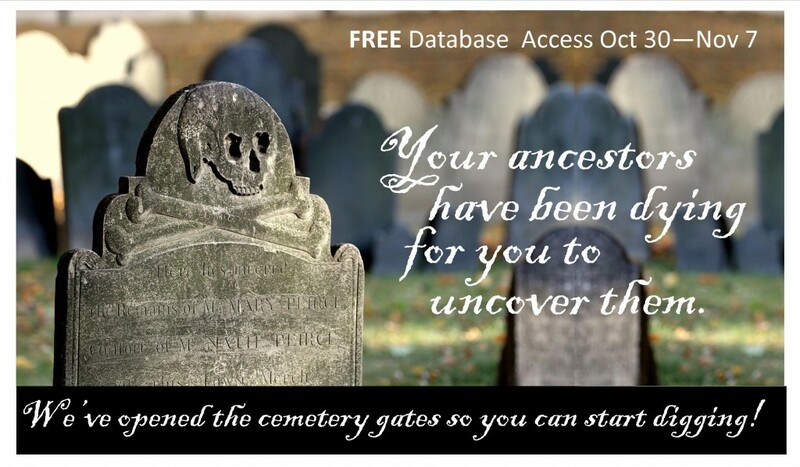 Just in time for the Halloween celebrations and to add some fun to ancestral research this holiday, AmericanAncestors.org and New England Historic Genealogical Society (NEHGS) have made their complete collection of American cemetery databases accessible for FREE to guest users on their data-rich website. The collection of more than 100 databases comprising more than one million records is accessible FREE from Friday, October 30, through midnight on Saturday, November 7. The collection includes cemetery transcriptions from New England and other states and was compiled from many different sources to create a unique group of cemetery offerings. Registration at AmericanAncestors.org is required as a FREE Guest Member to gain access to these valuable resources. Guest User accounts allow web visitors to use a limited suite of databases on AmericanAncestors.org and to access web content such as making purchases from the NEHGS online store. Unlimited access to more than one billion online records on the website and to other benefits is through membership at NEHGS. Family historians may start digging for their ancestors in these historic American cemeteries at: http://www.americanancestors.org/free-cemetery-databases.